Have a question on Ninja 250 SL? Ninja 250 SL is available in 1 different colors - Green. One look at the Kawasaki website will have you convinced that they have a bike for every possible segment. So much so that they have two entry-level quarter-litre sport bikes. The Ninja 250 SL owes its existence to the SL tag at the end of its name. This stands for Super Light. We think. That’s because it is considerably lighter than the Ninja 250. Also, unlike the Ninja 250, this bike is powered by a single-cylinder engine, making it the only Ninja with a single cylinder engine. At RM 16689, it is also considerably cheaper than the other Ninja. Kawasaki first launched it in 2014. Now though it may soon find itself replaced by the newest iteration of the Ninja 250. Other alternatives to this bike include the Yamaha YZF-R25, the Honda CBR 250R, and the KTM RC 250. Here is everything that makes this bike so special. The SL tag after the Ninja 250 moniker can also stand for “Slim and Light”. And indeed, the bike is very slim. It is just 685 mm wide. At 1935 mm high, and 1075 mm tall, it is not much larger in other aspects either. It almost feels like a 125-cc bike. This even makes it seem a little feminine if we are being honest. As does the styling. First off, this bike gets a single sporty multi-reflector headlight. Probably to reflect its single-cylinder engine. The windshield stands in the middle of rear view mirrors which are stocky and keep the bike from getting any wider. From the sides, the bike’s fully faired bodywork with its flared and waisted sections has an hourglass-like look. Its business as usual at the tail end with a high, nigh on unusable pillion seat resting on top of a sharp scowl. Throughout, the bike shows good fit and finish perhaps due to everything being mounted so close to the chassis. The bike’s green and black color scheme also adds to this effect. The triple clamps for mounting the clip-on handlebars have been sculpted with lightening holes which give the cockpit a high-quality look. Also, featuring in the cockpit is a compact fully digital instrument display. Backlit in white, it shows a digital bar graph tachometer, speedometer, odometer dual trip meters, clock, and a fuel gauge. But no gear position indicator. Also included are lightweight Ninja style wheels that save half a kilo over the Ninja 250’s wheels. This 17-inch five Y spoke wheels are shod with 100/80 tyres up front and 130/70 tyres on the rear. The Ninja 250 SL uses a compact and lightweight high tensile steel trellis frame. This contributes to the bike’s slim nature making it very suitable for filtering through city traffic. And you will be doing a lot of filtering. The bike uses clip-on handlebars which because of the narrow nature of the bike are very sensitive. Even the slightest movement is immediately reciprocated by the front wheel, making the bike very nimble. The 37 mm telescopic front forks and the 5-way adjustable for pre-load Uni-Trak rear suspension makes the best use of this and the low 151 kg bulk of the bike. These clip-on handlebars, however, are not the most comfortable. The windshield is also very much useless. The seat is very small and forces a riding position that rests on your wrists. The 780 mm set height is very commendable, but this bike is not really meant for long rides. The Kawasaki Ninja 250 SL is powered by a 249 cc liquid-cooled and fuel injected DOHC single-cylinder engine with 4 valves. It is mated to a 6-speed transmission. It produces 28 PS at 9700 rpm and 22.6 Nm of torque at 8200 rpm. The engine has been tuned to provide smooth and responsive power delivery. Especially at low and medium rev range with a very healthy top end. The engine gains revs quickly and is happiest at higher revs. This gives the bike great acceleration that keeps up with the bike’s lightweight handling while also giving it a good top speed of 145 kmph. The fuel tank has a capacity of 11-litre and can achieve a fuel economy figure of around 23 kmpl. Braking on the Kawasaki Ninja 250 SL consists of a single 290 mm disc on the front and a 220 mm disc on the rear, both using dual piston calliper. There is no ABS but the brakes themselves are good enough. The Kawasaki Ninja 250 SL is just as sharp as it looks. It has superbike ergonomics and handling in a compact and lightweight package. It is also a much cheaper alternative to its competitors. A very worthy contender that certainly deserves more attention. What are the Safety Features Available in Kawasaki Ninja 250 SL? 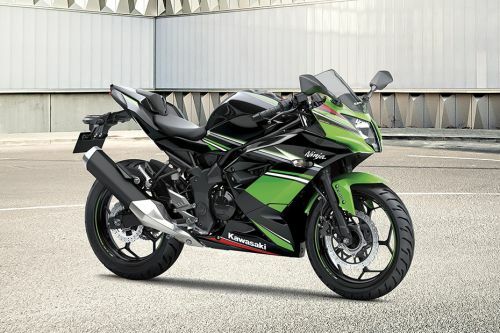 Is Kawasaki Ninja 250 SL available in Electric?